Recently, my family and I adopted two new dogs, Pete and Mary. They are both black and white English setters. Both are abandoned young strays, from two different shelters some 40 miles apart. Both sweet and loving and worth all the extra time, energy and patience it takes to help them relax into their new home. They’re both wonderful, and I adore them. But why two dogs, you ask? Because last year, after nearly nine months of trudging through profound grief, I realized, corny as it may sound, that my heart could open itself again—even after the death of Ruby, who for 13 years was the best friend I’ve ever had. The mighty shadow Ruby left in her wake is so all-encompassing, it takes two dogs to fill it. Anyone who’s ever loved a dog, or any sort of pet, with reckless abandon also sets themselves up for an inevitable, gutting loss. I tried to prepare myself for this when Ruby showed signs of illness and advanced age a full year before I was finally forced to put her down, a terrible euphemism for killing a creature who trusts you implicitly, one you love as a child. I wrote blog posts forecasting how tough her imminent death would be on our family. I even painted portraits—something that might make you laugh out loud to read, but attests to the level of grief I saw coming. So, while stroking Ruby’s head, I witnessed the long needle piercing her gorgeous coat. I bore her alarmed yelp once the killing cocktail took hold. I held her last, quivering look into my eyes before she fell slack forever. And then I clung to her lifeless form, sobbing uncontrollably, feeling as if some part of my soul had been ripped out, because she was more than a dog to me, to all of us. She was a talisman. A silent partner. A cherished confidant. She was an integral, irreplaceable part of our family. And love is love. When a great love is lost, the depth of grieving is reciprocal. She died at 10 in the morning. I took to my bed, blinds down, until it was time to get the kids from school. The world went black that day, and for many days after. But for other people in my periphery, our planet continued circling the sun. Kids still shouted and laughed, school remained in session, and the calendar dates marched forward, one by one. Yet I felt strangely out of sync. There was no dog to greet me at the door when I got home, no loyal friend to sit patiently at my feet while I worked on my computer. It’s simple to say, but I missed Ruby. I missed her so very much. I found solace in others who had lost their dogs, and was struck by how each broke down in tears as they remembered how difficult it was to say goodbye. We grieve the loss of people with so many rituals, and those rituals help us process death. If love is love, and grief is grief, then those same types of rituals should apply to our deceased pets. And why should we feel embarrassed by the intensity of our feelings? My family did a number of things in the days and months after Ruby’s passing. If sharing them helps even one family out there going through something similar, I’ll be glad I did so. 1. I saved a small part of her. Just like a mother who clips her child’s hair after a first haircut, I cut a small section of Ruby’s gorgeous white and golden fur and placed it into an airtight plastic container. I did this right before she died. I also removed her collar and saved this, too. Both are in my jewelry box for safekeeping, among other family heirlooms. And when I really need to—not often, but occasionally—I visit these remembrances of her, because they remind me she was real, as was our bond. 2. We scattered some of her ashes in a special spot. Ruby first came to us while we were living in Washington, D.C. So my kids, husband and I trekked to her favorite old haunt at a park in Georgetown. Together, we took turns sharing a memory about or declaration of love for our dog. Then we scattered some of her ashes beneath a flowering bush overlooking a secluded swimming spot, one where unleashed dogs continue to play today. 3. We planted a butterfly bush in her memory in our backyard. A bird dog through and through, Ruby loved to stalk, point and pounce on butterflies of every variety. It was her favorite sport. So with ceremony we planted two buddleia bushes that can be seen from our large family room window, a forever reminder of what grew between us when she was alive. We fertilized them with the remaining ashes. Now, the colorful butterflies come in droves, and Pete and Mary, her new, younger siblings of the same breed, get to chase them, too. 4. We placed her on a shelf—but never our memories of her. After she was cremated, we were given Ruby’s remains in a small wooden urn. It’s simple and innocuous, and only we know what’s inside. She sits high within a built-in and looks down on our daily activities in the family room. We loved her so much. And she’s still with us. 5. We fully grieved her before we considered adopting again. And we knew we could never replace her. Some families rush out and immediately find a replacement pet. I knew if I got another dog too soon I would only compare the poor new pup to Ruby, and it wouldn’t be fair to either of us. So I allowed my grief to run its own natural course. For a long time, I thought I would never get another dog. 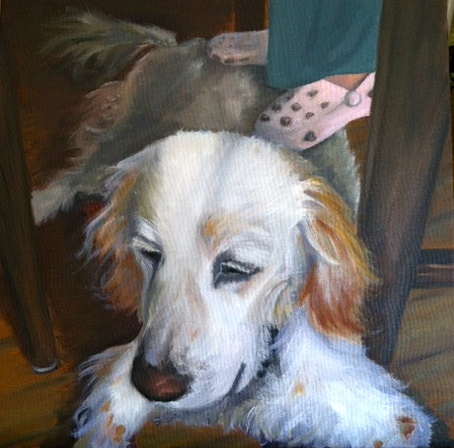 But then one day, maybe seven or eight months after Ruby died, I found myself adding my name to an English setter rescue list, one that alerted me when the breed was found at a shelter in my state of New York. My heart led me when it was ready. And that’s how I found Pete and Mary. And I was ready to love them—as I do—and eventually one day lose them, facing the cycle all over again. Because that’s what we humans do. We love. Even when we know it’s going hurt. And, ultimately, it’s worth every bit of heartache, isn’t it?